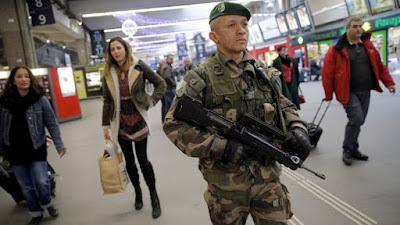 An autopsy was conducted by French officials in Paris, France on Sunday after the suspected Islamic extremist that decided to take a soldier hostage was either drunk or high when the decision was made. The airport that he attacked was Paris' Orly Airport which is the capital's second largest airport. The suspect who's name is Ziyed Ben Belgacem, did stop at a bar in the early hours of Saturday morning. This happened just about four hours before he first fired bird shot at traffic police. The shot fired injured an officer in the face. ninety minutes later he attacked the military patrol at Orly. This caused panic and of course, the shutdown of the airport. Police did search his flat and find Cocaine in it. Paris Prosecutor Francois Molins said. A man that identified himself as the man's father had an interview with French radio station Europe 1 on Sunday. The father of the suspect said that Belgacem was not a practicing Muslim and drank alcohol. "My son was never a terrorist. He never attended prayer. He drank. But under the effects of alcohol and cannabis, this is where one ends up," Said the father. Europe 1 radio station did not give the father's name. The Paris prosecutor's office did say that the father of Belgacem was released from custody overnight. However, Belgacem's cousin and brother are still being questioned by police at this time. An interesting fact is that after the initial incident of when the first birdshot was fired at police Molins said that Belgacem had called his father and brother after the catalyst of the entire incident. It is said that he told his family that he had made a mistake. Police took blood samples and tried to examine it for drug and alcohol traces to determine the possible attack cause. The 39-year-old Frenchman has had a long past of criminal offenses and served jail time before for drugs and robbery offenses. Molins said that the suspect was out on bail when this incident happened. The suspect was also banned from leaving France and had to report to police on the regular. Belgacem was handed preliminary charges for robberies in the year of 2016. He also may have been radicalized since he was flagged for radicalism during a spell in detention from 2011-2012, Molins also said. The suspect even had his house as one of the homes that were searched after the Paris attacked that happened in November 2015 that killed 130 people. It is said that Belgacem said that the wanted to die for Allah and pulled away from the rifle of the soldier he then took hostage. However, he was shot and killed by the female soldiers two colleagues before he could fire the rifle in the airport. Molins said, "With a pistol in his right hand and a bag over his shoulder, he grabbed (the soldier) with his left arm, made her move backward by three to four meters, positioning her as a shield, and pointed his revolver at her forehead." According to the soldiers that were on scene, the attacker yelled "put down your weapons"put your hands on your head I am here to die for Allah. Whatever happens, there will be deaths." 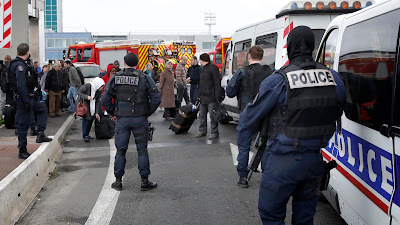 This attacker forced both of the terminals in the airport to shut down, this trapped many people who were just on flights that landed to be trapped within the planes not fully understanding what was going on. Authorities described this as a 90-minuted spree of destructive criminality. This was for sure a violent incident within the airport. This attack caused almost no injuries except for a wounded traffic police officer. 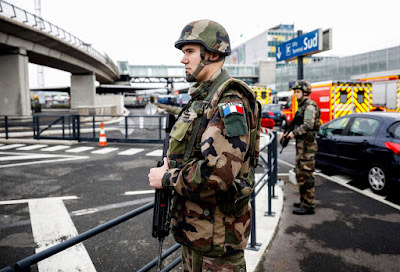 However, the attack caused a sense of discomfort in France, which is still under a state of emergency after attacks within the past two years have killed 235 people.